Can you please offer help for the PRTG setup wizard Invalid License Key screen? I have entered no or invalid license information. Unfortunately, either the entered name, license key, or both are not valid. Please obtain valid license key information to continue or go back and choose to install the freeware edition. No license key is required for the freeware edition. Note: You cannot enter a NetFlow license key in this wizard. 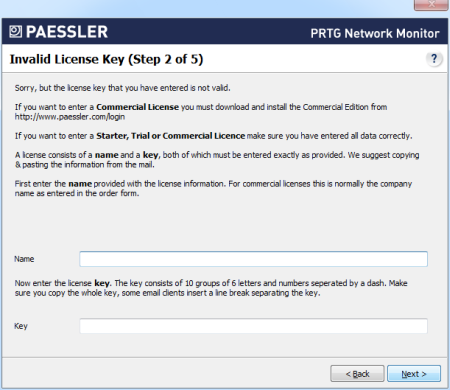 If you have purchased a separate NetFlow license key, please enter it later in the PRTG Server Administrator program.